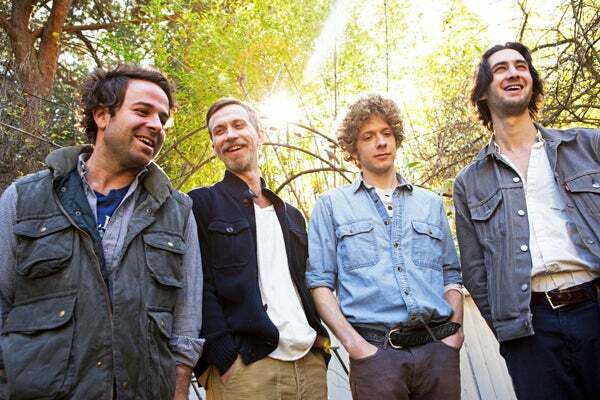 Over its three albums, Laurel Canyon, Los Angeles-based band Dawes has slowly gained a following as one of the best folk-rock acts in the business. This has as a lot to do with the band's stellar work ethic — it tours relentlessly behind its releases, playing as many venues as possible. "It’s a fairly streamlined approach to the job: Make the album, release it, tour it," explains lead-singer Taylor Goldsmith. Recently, this attitude has led Dawes to even higher realms of success, including an opening tour with none other than Bob Dylan. "That was probably the coolest thing that’s ever happened to us," says Goldsmith, still visibly giddy even months after the stint has ended. The band's latest venture will be two nights of special performances that benefit the Newport Festivals Foundation. The shows will include a host of other performers joining the band on stage. We caught up with the band shortly after its recent headlining show at Terminal 5 to talk the its inspirations, Bob Dylan, and life on the road. Your album has been out for a little while now — how have the new songs been going in a live setting? Are there any songs that haven’t translated live the way you imagined they would?? You guys just opened for Bob Dylan — that’s huge! What was it like knowing you were going to be playing with Dylan? Did you get to talk to him at all? How is it different opening for an audience that’s primarily there to see an artist like Dylan versus when you’re playing a big show on your own? How do you guys stay on good terms with each other while you’re on the road in a cramped van for hours on end? Taylor Goldsmith: “Are we on good terms? [Laughs]"
What do you miss the most about home when you’re travelling? What’s next for you guys? You’re already three albums in; where to now? What did you guys want to be when you were growing up? What about now? Are you still into the same stuff? Is there anything that’s been super inspirational? Taylor Goldsmith: “I think we all are pretty much the same." What do you listen to when you’re going out? Do you imagine where people will be listening to it, whether they’re driving down the highway or at a party? What places are you dying to play?